Faith and the Orthodox Church united the separate tribes into one nation. Faith in the Kingdom of God and the search for it, the search for righteousness [pravda] became the most salient characteristic of the Russian people. For the sake of the Kingdom of God, for the sake of participation in it, for the sake of prayer, Russian ascetics left the vanity of the world and went into the forests, onto uninhabited islands. They sought only the Kingdom of God. They did not want to found or build anything; they went away from people, but people followed after them for the sake of the Kingdom of God, which was present on those islands and in those forests around the righteous ones, and thus lavras and monasteries grew up. The search for righteousness is a basic thread in the life of the Russian people, and it is not by chance that the first written code of laws, which was designed to regulate life, was called "Russian Justice" [Russkaya Pravda ]. It was not only those who withdrew from the world and from the company of men, who thought about heaven and the Kingdom of God; all believing Russian people understood the meaning of life. All who truly contributed to the development of Russia as a nation, likewise considered that their primary concern was to be faithful to the Divine Kingdom and to Divine Truth [Pravda]. In Russia there were princes, military leaders, landowners, people of all ranks and occupations; and all had in common a fundamental understanding and striving, which were the acquisition of the Kingdom of God and participation in it. This was the meaning of life. Saint Alexander Nevsky spent his entire life in struggles on behalf of the military and the State; he rode on horseback through the whole of Siberia to the Tartar khan in order to establish peace in Russia, and became renowned for his military victories. But when he fell ill and death came, he accepted it as liberation from the labors of earthly life and gave himself over to that which was dearer than everything to his soul and became a monk, in order to enter the longed-for Kingdom of God, not as an earthly warrior, but as a warrior of Christ. Prince Theodore of Smolensk likewise accepted monasticism before his death. In their striving for the Kingdom of God, such spiritual leaders of the Russian people were the best exponents of the fundamental trait of the nation's spiritual life, of the basic force which guided its historical life. The assimilation of the Christian faith regenerated the Russian princes as well. Authority is always an expression of consciousness and will. Authority is always guided by one or another philosophy, by one or another understanding of the meaning and purpose of life and its activity. Before Saint Vladimir, Russian princes were leaders of warring tribes and waged wars for the sake of military spoil and glory. Having become Christians, they became the heads of separate parts of one nation. With the acceptance of Christianity came a sense of unity. Righteousness was in the brotherhood of princes, and internecine war became unrighteous. Prince Vladimir gave the Russian people a new meaning of life and a new vitality. Calamities, failures and defeats are powerless before the main force of life, powerless before spiritual life. The Kingdom of God, the spiritual joy of participating in it remain untouched. The terrible storm passes, and again a man lives. Thus, during the most cruel tortures, the martyrs rejoiced, sensing God's grace. This is the source of Russia's vitality. Calamities do not strike her heart. The Tartars burned the whole of Russia. Kiev fell, and in the same year Novgorod arose; and that great commander and leader of the Russian people, the Right-believing Prince Alexander Nevsky, roused the Russian people for a struggle, not with the Tartars, who had racked Russia's body, but with the Catholic Swedes, who, taking advantage of Russia's misfortune, wanted to seize the soul of the Russian people and kill the spiritual might of the Russian nation and Russia. For Alexander Nevsky it was necessary above all to preserve that spiritual might. The history of Moscow's ascendancy is a clear confirmation of this same idea. In its nascence, Moscow was a not very large, local amalgamation. But at its head stood right-believing princes, who had assimilated this Orthodox understanding of righteousness; and therefore, when the holy hierarch, Metropolitan Peter, told the prince that Moscow would rise to prominence and that the hierarch himself would live and be buried there if the prince built a home in Moscow for the Most Holy Mother of God, the prince fulfilled this covenant. In other words, the holy hierarch Peter told him, "If thou wilt be faithful to Orthodoxy to the end and wilt first of all seek the Kingdom of God and His righteousness, then all these things — everything earthly, everything of this life, everything pertaining to the state — will be added unto thee." Such was Moscow's intent, and it was faithful to Saint Peter's testament; the night muster of the military watch on the Kremlin's walls took place with the words: "O Most Holy Theo-tokos, save us!" This does not mean that Russia's life and people were holy. No! Men are always sinful; but when there is an awareness of good and evil, when there is a striving towards righteousness, restoration is possible. This is what is important and soul-saving. In its historical life, sinful Moscow, the capital of sinful Russia, fell to the bottom, but it arose again because the consciousness of righteousness did not die. During the Time of Troubles, Russia fell so low that all her enemies were convinced that she was mortally stricken. In Russia there was no tsar, no authority, no army. In Moscow, foreigners were in power. People became "fainthearted" and weak, and they awaited salvation from the foreigners with whom they ingratiated themselves. Destruction was inescapable, and Russia would inevitably have perished had the consciousness of righteousness been completely lost. But the holy hierarch Germogen saved Russia and the Russian people. The enemies of Russia held him in a cellar in the Kremlin, mocked him, tortured him, and tried to force him to submit to them, thereby betraying the Russian understanding of righteousness. Saint Germogen was tortured to death, but spiritually he did not surrender, and he called Russia to her historical path as a Christian state with a Christian authority; he called her to remember the truth and to be faithful to it. In faith and confession, Saint Germogen spiritually and morally regenerated the Russian nation, and it again started on the path of seeking the Kingdom of God and His righteousness, the righteousness of subordinating the earthly life of the state to spiritual principles. And Russia rose up. In history there is no other example of such a profound fall of a state and such a rapid, miraculous resurgence, within a year's time, when spiritually and morally the people rose up. Such is the history of Russia, such is her path. After Tsar Peter I, public life turned aside from this path. It did not turn aside completely, but it lost the clarity of the consciousness of righteousness, the clarity of faith in the Gospel Truth, "Seek ye first the Kingdom of God and His righteousness." The heavy sufferings of the Russian people are the results of the betrayal of Russia herself, her path, her calling. But those heavy sufferings and the melancholy of life under the cruel atheists' authority indicate that the Russian people has not completely lost the consciousness of righteousness, that it feels spiritually and morally weighed down by the unrighteousness of the godless state and the godless authority. Russia will arise, just as she arose before. She will arise when faith will flame up, when people will arise spiritually, when a clear, firm faith in the truth [pravda] of the Saviour's words, Seek ye first the Kingdom of God and His righteousness and all these things will be added to you, will again be dear to them. Russia will arise when she will come to love the Faith and the confession of Orthodoxy, when she will see and come to love the righteous and the confessors. 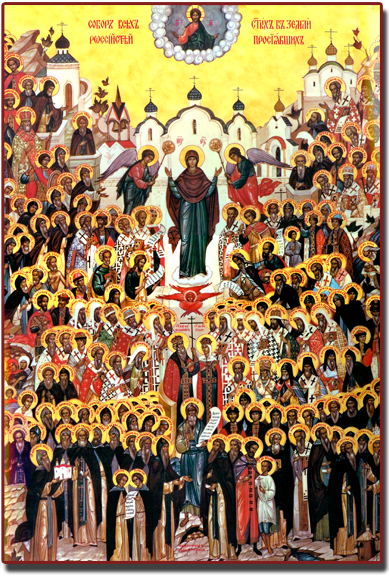 Today, on the day of All the Saints Who Have Shown Forth in the Russian Land, the Church points to them, and the faithful spiritually exult on seeing what a multitude of them there are in the Kingdom of God. And there are countless numbers of those not yet glorified! Here Metropolitan Vladimir of Kiev goes to his death, quietly, fearlessly. The murderers lead him out from the gates of the Lavra, in order to kill him outside the city, as they killed the Lord and Saviour, and in silence, like a lamb for the slaughter, the hierarch accepts death for Christ, for the Faith, for the Russian Church, because he sought first of all to acquire the Kingdom of God and eternal life. There is a multitude of martyrs and confessors; and again we see God's blessing on their struggle of faith, and again the manifestation of incorrupt relics: the bodies of the righteous, who already live according to the laws of the future life, where there is neither suffering nor corruption, and the incorruption of their relics testify of this. Thus, the incorrupt remains of the Grand Duchess Elizabeth, which rest in the Gethsemane convent, testify to us of her righteousness in the eyes of God. 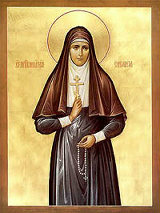 Russia will arise when she will lift up her gaze and see that all the saints who have shown forth in the Russian land are alive in the Kingdom of God, that the spirit of eternal life is in them, and that it is necessary for us to be with them and spiritually touch and communicate of their eternal life. Herein lies the salvation of Russia — and of the whole world. In Russia today there is no spirit of life, no joy of life. Everyone is afraid of it, as they are afraid of demons. Russia also was terrible to other powers, but because she drew peoples to herself. Russian humility created faithfulness to the commandment, "Seek ye first the kingdom of God and His righteousness." It humbled authority as well, and in the days of its greatest earthly glory, Russian authority, by the lips of Tsar Alexander I, confessed itself as a Christian authority, and on the monument of its glory wrote: "Not unto us, not unto us, but unto Thy Name." The Russian heaven, the Russian saints call us to be with them, as they are with us. They call us to commune of the spirit of eternal life, and the world thirsts for that spirit. The restoration of Russia is needed by the whole world, from which the spirit of life has departed, and it all shakes in fear, as in the face of an earthquake. Russia awaits a Christ-loving army, Christ-loving tsars and leaders, who will lead the Russian people, not for earthly glory, but for the sake of faithfulness to the Russian Path of Righteousness. "Not unto us, not unto us, but unto Thy Name." In repentance, in faith, in purification, may the Russian land be renewed and may Holy Rus' arise. AUSTIN – Scores of state workers who help people sign up for public assistance are quitting every month, but not Alec Davis. As the state turns to private companies to process applications, he stays to help tackle a mountain of daily tasks. The problems with the transition are so extensive that the state recently canceled plans to lay off 1,000 workers and scrambled to keep eligibility workers, offering bonuses of nearly $1,900 each. As a "senior disposition worker," Mr. Davis helps determine who gets food stamps, Medicaid and welfare. The full range of the state's outsourcing experiment lies beyond his field of vision, though his south Austin office tower houses one of the private call centers. But what he has seen, he said, is "a horrible mess" – slow computers, long electronic "queues" of applications and mistakes by the private companies' workers that create big hassles for those seeking state aid. "It's going a lot worse than we thought," he said. "You can't work there and not know it." Mr. Davis and other veteran state workers face Herculean tasks in helping the state move to privately run call and document processing centers. He agreed to speak candidly about problems that have roiled Texas' revamping of eligibility determination, though he said he speaks only for himself. State leaders defend the overall privatization project, predicting more efficient services for less cost to taxpayers. And the state's main contractor, a group led by the U.S. unit of Bermuda-based Accenture Ltd., says the transition is smoothing out. But some of Mr. Davis' colleagues in state field offices also note problems, even though privatization is so far limited to pilot programs in Travis and Hays counties. These workers say job insecurity and changing mandates hurt morale and drive co-workers to quit. "It's a huge reduction in staff in the last few months," said Bridget Walker, a nine-year caseworker in Dallas. "I have more cases [and] I'm doing longer hours. It is a challenge." Procedures and plans to roll out the new system change rapidly, causing confusion among applicants and employees, said 16-year caseworker Joan Barasch of San Antonio. "People's cases are getting shifted around," she said. "It's hard to figure out who belongs to whom. People are having to turn in multiple applications to get taken care of." State agency chiefs and politicians who defend the new system dismiss critics as shortsighted. The defenders point out that state employee groups have lost members to the outsourcing. They also say advocates of the poor who criticize the changes as poorly planned are overlooking benefits of the call centers, such as fewer trips to a field office and the convenience of applying by phone or Internet. Mr. Davis, though, quit the Texas State Employees Union a year ago. The 39-year-old, who has spent much of his adult life working for the state, agrees that the old system relied too much on paperwork and in-person interviews. In fact, he jumped into the Austin privatization experiment from a field office in Athens because he wanted to "try something different." Mr. Davis says that the Legislature's decision three years ago to push privatizing of eligibility services signaled to state workers that "we're expendable," but he still gets "a sense of gratification" from helping the needy. Anger and guilt over the system's failings have led him to hand out cards urging people with call-center problems to contact state and federal agencies to complain. "This is just a way to help people tell someone what they've experienced," he said. Start-up problems forced Gov. Rick Perry's administration in April to postpone extending the new system beyond greater Austin-San Marcos. A scheduled start date for the Dallas-Fort Worth area of December is on hold. If resumed, the rollout would close scores of field offices and shift many signups to four call centers run by Accenture; Maximus Inc. of Reston, Va.; and several subcontractors. The group won the five-year, $899 million contract last summer. • The Legislature repeatedly slashed funding for the old system. Today, the state has about a third of the 12,000 permanent eligibility workers it had in 1996. Nearly 1,200 temporary workers have been added, but they're poorly trained. Customer service has deteriorated. • State managers should listen to line workers and fix flaws in an unwieldy computer program called the Texas Integrated Eligibility Redesign System. • Federally created social safety net programs have very complicated eligibility rules. The vendor's call center operators – some making $8 an hour – can't possibly learn the ropes in just a few weeks of training. "I'm not against the change," Mr. Davis said. But he said he was shocked by the start-up's tumult. He said his state unit has lost half its workers in five months. He is just now reviewing food stamp applications made in February and March, though they were supposed to have been processed no later than April. He has spoken with aid applicants who had phoned call centers 20 times and still not gotten answers. To reduce an applications backlog, the state has adopted a "quota" system, he said. Two weeks ago, Mr. Davis said, he and colleagues were required to sign a paper in which they agreed to decide 15 cases per eight-hour shift and work at least five hours a week of overtime. During overtime work, they must finish at least two cases per hour, he said. But many cases handed to disposition workers are poorly prepared, and the computer program stalls if he and his colleagues add information. He said disposition workers sit in cubicles, and their phone conversations with applicants – required by federal law to be confidential – easily can be overhead. Stephanie Goodman, a spokeswoman for the Health and Human Services Commission, said the state believes early flaws can be cured. She said the call centers have reduced wait times and how many callers hang up. "We want to see them sustain that for some time," she said. Training of call center operators has improved "but there's more work to be done," she said. Ms. Goodman said her boss, Commissioner Albert Hawkins, still isn't satisfied with the Accenture group's work. "If you're judging the system goals by the performance today, then I can understand why he would think that," she said of Mr. Davis. "Because it's not working the way it should." She said the seven-year-old computer system was not designed for use in call centers but for a face-to-face interview, conducted after all needed information had been brought to a state field office. The state still believes a "long-term solution" will work, she said. "It's the interim solution we put in place that's causing problems," Ms. Goodman said. Jill Angelo, a consultant who recently was hired to speak for the Accenture-led group, acknowledged the early difficulties but said "we are making progress." Ms. Angelo said the contractor is improving customer service and "call quality." She noted that another company, Deloitte, built the $300 million computer system. And she promised improvements soon. Back on the fourth floor of the Southfield Building in Austin, Mr. Davis said he is frustrated but can't chuck his $33,000-a-year job. He said he needs employer-based health insurance because he has diabetes and high blood pressure. Even with the state's relatively generous coverage, he said, he shells out nearly $200 a month for medicine. Mr. Davis, a Tyler native, holds an associate degree in art, drafting and design from Wade College in Dallas. He worked for two years as an unpaid volunteer at the Athens eligibility field office before getting hired. He toiled three years there as a clerk, 10 as a caseworker. In 12 of his 13 years with the state, he said supervisors gave him the highest job evaluation – "superior." The only other time was an "exceeds expectations," he said. The good ratings mean he's eligible for the retention bonuses – $930 this month and another $930 at the end of the year. But Mr. Davis said he would simply settle for less stress. You can see pictures of our 2006 Icon Exhibit here. And you can see pictures of Metropolitan Laurus' visit to our parish on January 28th, 2006, here. Here's a helpful hint for hopeful Country groups of the future... if you want to be successful, there is one demographic group that you don't want to offend: conservative white folks. Yes, it is true that one can find country fans who are black, hispanic, asian, etc, but this is the one group that if you hack `em off, your goose is cooked. Likewise, if you are a hip-hop group, you probably wouldn't want to offend black folks, and if you were a Tejano group, you probably would want to pay extra attention to not ticking off hispanics. Newsflash for Natalie Maines: Patriotism comes a close second to ones religion on the list of things most important to people in Dixie... and they have little patience for people who thumb their nose at God or Country, even if they are a group of Chicks from Dixie who can carry a nice tune. Currently the Dixie Chicks are trying to portray themselves as martyrs, and describe those who have been critical of them as being "McCarthyites" who are trying to deprive them of their freedom of speech. Here's another newsflash for the Dixie Chicks: the way freedom of speech works is you get to say what you want, no matter how stupid it might be, and then other people are equally free to tell you how stupid they think you are for having said it. The Dixie Chicks have the freedom to attack Bush, and country fans have the freedom to not buy their records, lobby radio stations to stop playing their music, and to not spend their money on Dixie Chick concert tickets. And the more the Dixie Chicks excercise their right to offend their fan base, the more their fan base is going to turn their backs on the Dixie Chicks. Just recently the Dixie Chicks had to cancel concerts all over the South and midwest because they weren't selling enough tickets. That's not McCarthyism, that's freedom. Freedom for people to say stupid things, and freedom for people to respond, and to spend their money as they see fit. Personally, I was never a big fan of the Dixie Chicks... they're about 100 years too modern for my tastes, but I felt sorry for them when they initially started catching flack for what Natalie Maines said about Bush... not because I agreed with what she said, but when they apologized, it seemed to me that they should have been given a break. But this attitude that they have adopted since then, that they should be allowed to say what they want, and no one else should be allowed to respond is far more offensive than the original remarks. Celebrities in general would be well advised to remember that their fans love them for what ever it is that they do that makes them celebrities. We don't want to know what they think about politics, and if they want to keep their fan base's affections, they would generally be better off to keep their political opinions to themselves. How bad is it getting at HHSC? According to my sources who are still on the inside, it continues to get worse every day. Timeliness is swirling down the toilet, and the corrective action plan is not to change course from an unworkable plan that is doomed to end in disaster, but to make staff take time away from their work to be retrained on Food Stamp timeliness policies... as if the problem was that people didn't know that applications should be worked in less than 5 months. Also, staff have been working nearly every Saturday, just so as to have a day that they could wrap up cases without the phone ringing off the hook, and people waiting to see them in the lobby... however, it is now being suggested that they make working Saturday mandatory, and that they open up the office and schedule more appointments, thus eliminating the primary reason people have been working on Saturday voluntarily. What people who have never actually worked cases do not understand (and these seem to be the people making all the decisions) is that you can interview people all day every day, and not certify a single case. To actually issue benefits, you need some time when you are not interviewing people in order to wrap those cases up, make sure that they are correct, and process them. Otherwise you are just spinning your wheels. It seems that with the election cycle kicking into high gear in the near future, some people are getting nervous about how all of this will affect their chances of re-election. These "solutions" are non-solutions, that only result in giving the appearance of "doing something". It has long been the case that government agencies such as HHSC approach every problem with the assumption that there is no problem that training and a new report cannot fix. However, when you have a complete breakdown, such as we are now seeing, this is something like providing training to the crew of the Titanic on iceberg evasion, after the ship is already sinking. It may make some people feel better to know that someone is "doing something", but the "something" they are "doing" is a complete waste of time. Also, with HHSC trying desperately to hang on to the staff they still have who actually know how to work a case, it seems a rather short sighted approach to burn those people out by insisting that they work 6 days a week, when this will obviously result in lower morale, more unplanned leave, and more people who simply find another place to work. Personally, I thank God that I am no longer at HHSC, even though I often miss the way it used to be and the people I used to work with. Until they hit bottom, and start actually "doing something" to fix this problem, I can't see why anyone would want to stay that wasn't just hanging on to retire in the next year or two. A favorite past time for many, especially in the past century, has been to figure out who the antichrist will be before he appears and to figure out when he will appear before he does. The fuss over tomorrow's date of 6-06-06 is just the lattest of many examples. Let us not forget the best selling book, "88 Reasons Why the Rapture Could Be in 1988." Sales of that book fell off rather sharply in 1989. Christ told the Apostles "And he said unto them, It is not for you to know the times or the seasons, which the Father hath put in his own power" (Act 1:7). “But of that day and hour no one knows, not even the angels of heaven, but My Father only" (Matthew 24:36). This, however, has not stopped people from trying. Many have infact made a living off doing so. Hal Lindsey, for example, has made a rather comfortable living off of reading Biblical Prophecies into the headlines, and developing senarios that put the end in the not too distant future... distant enough for him not to give his books away, charge them all to his own Credit Cards, and leave the bill for the Anti-Christ... but not too distant for people to think they don't need to buy a copy and read his lattest predictions. A particular focus of facination has long been the number 666. "He [the antichrist] causes all, both small and great, rich and poor, free and slave, to receive a mark on their right hand or on their foreheads, and that no one may buy or sell except one who has the mark or the name of the beast, or the number of his name. Here is wisdom. Let him who has understanding calculate the number of the beast, for it is the number of a man: His number is 666" (Revelation 13:16-18). In the movie "The Omen", the antichrist is known by a birth mark in the shape of "666". Other movies and book see this as being a bar-code tatoo, or even a computer chip that the servent of the beast have implanted in their right hands and foreheads. The problem for modern readers is that most people do not realize that Greek and Hebrew Numerals are made from the letters of their respective alphabets, and so each letter has a numerical value... and hence, every name can be calculated. For example, the numerical value of William J. Clinton (if transliterated as `illiam i kleinton) adds up to 666. In Hebrew, Nero Ceasar adds up to 666. "It is therefore more certain and less hazardous to await the fulfilment of the prophecy than to be making surmises and casting about for any names that may present themselves, inasmuch as many names can be found possessing the number mentioned: and the same question will, after all, remain unsolved. For if there are many names found possessing this number, it will be asked which among them shall the coming man bear. It is not through a want of names containing the number of that name that I say this, but on account of the fear of God, and zeal for the the truth. For the name Euanthas contains the required number, but I make no allegation regarding it. Then also Lateinos [the Greek word for "Latins" (i.e., the Romans) or one might say "Latinos" if they wanted to be cute] has the number 666; and it is a very probable solution, this being the name of the last kingdom [of the four seen by Daniel]. For the Latins are they who at present bear rule; I will not, however, make any boast over this [coincidence].... We will not, however, incur the rick of pronouncing positively as to the name of the anti-christ; for if it were necessary that his name should be distinctly revealed in this present time, it would have been announced by the one who beheld the apocalyptic vision" (Against Heresies 5:30:3]. So it is not our job to pin the tail on the antichrist. When the antichrist comes, those who know the real Christ will have no trouble figuring out who he is, and in fact St. John tells us elsewhere (1 John 2:18) that many antichrists had already come in his own time. Nero was an antichrist. Hitler was an antichrist. Stalin was an antichrist. And one could name a few in our own time who stand against the real Christ, and persecute those who follow him. A final antichrist will come before the end... this we know, but we just need to make sure that we are following the Lamb, and not riding the goat, and we'll be OK.